‘Molly Whuppie’ is a Scottish story published in two volumes of English folklore collected in the 1890s by Joseph Jacobs. Three sisters are abandoned by their impoverished parents in a forest. They take refuge in a giant’s house who then tries to kill them. Molly Whuppie, the youngest and cleverest, saves their lives by putting the giant’s daughters’ gold chains around her sisters’ necks. This means he mistakenly kills his own children in their beds, instead of the sisters as he intended. After this she repeatedly outsmarts the giant and is rewarded by the king and made a princess. As a strong female protagonist Molly takes the central focus of the painting as she does in the story. The story praises resourcefulness, no matter how amoral, and the extreme brutality of her plan is juxtaposed with the calm innocence in the image of the sleeping sisters. 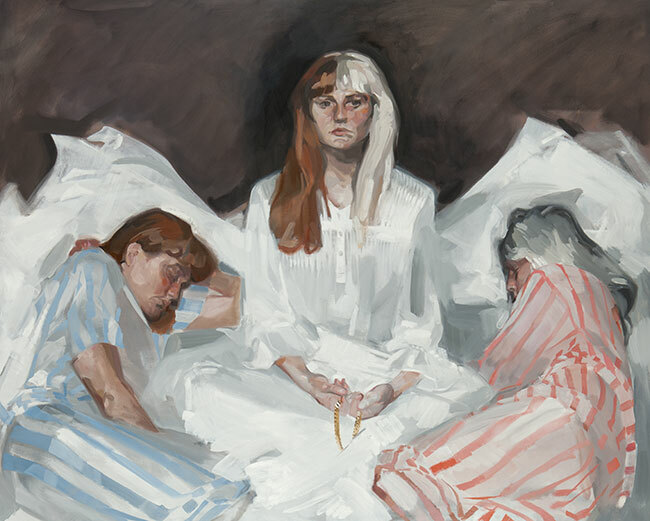 We can imagine the giant’s daughters sleeping in a mirror image of the painting, which helps us to empathise with both sides in a way that the written story does not. Molly is a character who is neither good nor evil; her actions, based on survival, blur the conventional lines of right and wrong. As a ‘consolatory fable’ it offers hope of release from poverty. The sisters’ survival in the face of destitution conveys a message of resistance, and a hope of escape, in a world of social injustice. Molly endures what children fear most: abandonment by their parents and exposure to predators. As Jung suggests the forest symbolises a forbidding unknown, set apart from human society, where inhabitants of fairyland and enemies lie. Molly uses a magical ‘Bridge of Hair’ to run away from the giant, which contradicts natural physical laws and gives both her and the reader a fantasy reality. This sense of wonder promises all kinds of riches and a romantic hope of another land where wonders are commonplace and desires are fulfilled. Based on a Scottish folktale by Joseph Jacobs - see below image for text. Описание ключар софия у нас. . Najlepsze kasyna online. . Смотрите информацию Sonnenschutz Auto здесь.